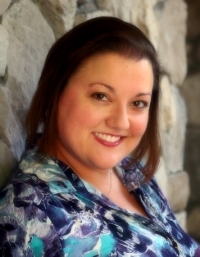 Enjoy today's Interview on Indie Author News with Indie Author Raine Thomas, Author of the YA Fantasy/Romance Series 'Daughters of Saraqael '. Raine Thomas will release the Book One DEFY of the follow-up Series: The Firstborn Trilogy on April 30, 2012. Raine Thomas is the author of the exciting and original series of YA fantasy/romance novels about the Estilorian plane. She followed her life-long passion for all things literary and earned her bachelor's degree in English with a focus in Creative Writing from Georgia State University, then her master's degree in Humanities from Central Michigan University. Having grown up in places such as Chicago, Atlanta and Orlando, much of her writing reflects these settings. Alan Kealey (Indie Author News): What is your (writing) background? Raine Thomas: “Writing” covers a lot of territory, doesn’t it? I was the English nerd in school begged by her friends to review their papers so that they’d get higher grades. (Yes, I enjoyed it!). My B.A. is in English with a focus in Creative Writing, and my master’s degree is in Humanities. Thus, writing was essential throughout my education, and it continued to be a pivotal part of my career. From writing legal briefs to generating multi-million dollar grants, my writing was frequently relied upon by former employers to further the success of their companies. Now, however, I’m delighted to write fiction and nonfiction as my profession, and I couldn’t be happier! Who are your favorite writers, your favorite book, and who or what are your writing influences? My favorite author is Nora Roberts. No one else can sway my emotions while reading as much as she can. I don’t have a single favorite book, but I absolutely love to read, and I’m not shy about crossing genres. Lately, most of my reads have been by indie authors. There is so much talent out there! As for writing influences, I’ll have to give a nod to Ms. Roberts as one of them. In particular, her ability to write from the male perspective has proven very influential. More recently, my readers have influenced my writing. I take into account every positive and negative comment made about my books so that I can continue to improve as a writer. Tell us about your writing process. Do you have a writing routine? My writing “routine” is less predictable than I’d like. Typically, I perform some author tasks in the morning after my husband and daughter have left for the day, before my work as a wedding planner begins. Then I pick my author tasks back up once the day is over and my daughter is in bed. In regards to the process of writing a book, my routine includes creating thorough character sketches, followed by a detailed outline (which I never stick to), and then launching into writing. "I’ve learned to operate on much less sleep than I once did. " What do you find easiest about writing? What about the hardest? I’d say the easiest thing about writing is probably the dialogue. It’s never been difficult for me to envision characters talking to each other and communicating that through my writing. The hardest thing is definitely finding the time to do it! I’ve learned to operate on much less sleep than I once did. When did you first know that you wanted to be a writer? Many authors seemed to know early on that they wanted to be professional writers. I, however, didn’t seriously consider becoming a published author until about three years ago. Yes, I wrote a number of stories over the years, but never with the idea of them being published. Only when I lost my job in the “economic downturn” of 2008 did I seriously consider making a career of my writing. There’s been no looking back since. Tell us a little about your novel 'Defy'. 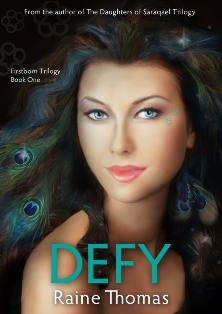 Defy is book one of the Firstborn trilogy. This YA fantasy/romance trilogy is a follow-up to my Daughters of Saraqael trilogy that released last year. However, I included a glossary in the beginning of Defy and took care to craft the story in a way that would allow new readers to follow along without necessarily having to read the first trilogy. The story centers on Tate, the seventeen-year-old daughter of Skye and Caleb (the main characters from my book Foretold). Tate’s thirst for adventure gets her into serious trouble, and she ends up connected to a mysterious male named Zachariah. She’ll find herself caught up in a dangerous plot involving the dark Mercesti class, and will have to battle her way back home. What inspired you to write the book? The response to my first trilogy was astonishing and humbling. I knew within a couple of weeks of publishing the Daughters of Saraqael trilogy that I wanted to continue the series about the Estilorians. My fans have proven highly motivating, checking in for regular updates on when they can expect the next installment. Defy is even dedicated to them! Who do you see as your target audience and where can we buy the book? My books are written for an intended audience of high school age and up. Fans of fantasy and paranormal romance who enjoy connecting with unique types of beings, exploring new worlds, and following characters through growth, adventure and love will enjoy Defy. On April 30th, Defy will be available on Amazon in eBook and paperback format, as well as in eBook format on Barnes and Noble and Smashwords. Once Smashwords distributes the file to other retailers, it will also be available in all other e-formats. The Daughters of Saraqael trilogy (Becoming, Central and Foretold) was published on July 24, 2011. By the end of last year, sales exceeded my goal of 10,000 books--which was a real moment for me--and they continue to sell well. The books have maintained between 4 and 5-star average ratings on Amazon, Barnes and Noble, Smashwords and Goodreads, with many hundreds of ratings between these sites. Also, Becoming made it to #15 on Amazon’s Paid Kindle Books list last year, making it a bestseller and thrilling me to pieces. Of course, I’d love to see Defy achieve even more success! What did you do to promote yourself and your book? For the launch of Defy, my largest promotion will be done through a book launch blog tour between April 30th and May 12th. I’ve recruited YA Bound (http://yabound.blogspot.com/) to assist me with the tour, and between their pool of amazing book bloggers and connections I’ve made myself, Defy will appear on more than 50 blogs between those dates. The majority of those bloggers are doing read-and-review posts, which means I’ll have a large number of reviews available by mid-May to use for more promotional efforts. Outside of that, social media is the primary avenue I use to promote my books. I’ve also got a book trailer in the works with Flatline-Films (http://flatline-films.com/) - [see below], and I’m very excited about that. There will also be paid advertisements on a variety of websites and a number of promotional giveaways. In the end, though, it will come down to work of mouth and the support of my readers! How long did it take it to write the book? It took me about four months to complete Defy. The editing was the most labor-intensive part, as I had a number of beta readers and wanted to be sure to address all issues and questions that arose in their critiques. Please tell us where you self-published the book. My books are all published on Amazon, Barnes and Noble and Smashwords. The paperbacks are done through Amazon’s affiliate, CreateSpace. "Self-publishing requires a lot of attention to detail." How smooth went the self-publishing process? Any issues? What are things to look for when self-publishing a book? Self-publishing requires a lot of attention to detail. There are a number of benefits to it, including having control over everything related to your books, and clear visibility of sales and the success or failure of marketing efforts. That said, there are several things that should never be overlooked when self-publishing. Among these are editing, a great cover designer and professional book formatting. Did you hire an editor and/or Cover Designer for your book? I write fairly cleanly, but I know that even a former freelance editor such as me needs another pair of eyes on her work before publication. My books go through several rounds of alpha and beta reads and revision (Defy went through even more than my other books). This process is so important! My covers are all designed by the brilliant Devan Edwards of Nimbi Design (http://nimbidesign.wordpress.com/book-cover-design/). If it hadn’t been for her amazing work on my covers, I doubt I would have made a fraction of the book sales that I have. Many of my early readers told me they bought the books based on their covers alone! This is truly a worthwhile investment for any self-published author. "...build a social media platform as soon as possible." Can you give some tips for other Indie Authors regarding the writing and self-publishing process? It’s worth reiterating the points I made above: make sure your book is well-edited, that it has an attractive cover, and that it is properly formatted. Some authors might say that they can’t afford to make these initial investments in their books. On the contrary, you can’t afford not to. Don’t be afraid to work with up-and-coming service providers to get these things accomplished on a budget. There are many talented editors, cover designers, filmmakers, etc. who are trying to establish a following. Many of them will work with authors at great discounts just to build a client base. Believe me when I say that you will lose more than you gain if you skip any of these steps! I’ll also add that it’s crucial to build a social media platform as soon as possible. Ideally, an author will begin this step well before the book is published. Join at least the two most popular social networking sites: Twitter and Facebook. Also consider joining Google+, LinkedIn, Pinterest, and any other sites that you think you can reasonably maintain. The more you’re on those sites, the more likely you are to find potential readers. Network, network, network! For help with this, a wonderful resource is Rachel Thompson with Bad Redhead Media. Are you working on another book project? Can you tell us a little about it? At the moment, I’m wrapping up the first draft of Shift, Book Two of the Firstborn Trilogy. This book picks up where Defy leaves off, and switches focus from Tate to her cousin, Sophia. The overreaching conflict between the good and evil classes of Estilorians begun in Defy continues in Shift and will conclude in Elder. Are you planning to move forward as an Indie author or are you looking forward to have one of your next books to be traditionally published? So far, I’ve really enjoyed being an indie author and don’t have any plans on pursuing a traditional publishing contract. However, as my career has progressed over the past nine months, I’ve definitely realized that I could benefit from the assistance of an agent to help me take my books to the next level. Among my short-term goals is to begin querying once Defy is released. Where do you see the book market in 5 or 10 years? Will there be only 99cent eBooks or do you see this just as a marketing phase of the book sellers to move readers into the digital book market in a fight for future market shares? What a great question! I’m far from an industry expert, but I think there’s no denying that eBooks are here to stay. That doesn’t mean that paperbacks and hardbacks will disappear altogether—which would break my heart! But it does mean that traditional publishers will have to seriously consider how they can become more competitive in the eBook market. Much of that is price point. Will all eBooks eventually go to 99 cents? I don’t think so. Quite frankly, unless you’re selling tens of thousands of books, you won’t be able to make a living at that price point. However, eBooks priced significantly lower than paperbacks and hard covers is not only inevitable, it’s logical. Do you write full-time or do you have a day job? I work full-time as a wedding planner and write every spare moment I have. It’s a very interesting career combo! How can readers connect with you? Readers can reach me via my Blog, Twitter, Facebook. Thanks so much for having me on the Indie Author News! Thank you so much for the Interview, Raine. Good Luck with your future book projects. Seventeen-year-old Tate is about to make her parents’ dreams come true. Unfortunately for her, their dreams foretell her death. Eager to explore more of the Estilorian plane and prove her abilities, Tate goes against her parents’ wishes and leaves the area of protection surrounding her home. Her choice puts her on a deadly path…one that leaves her alone, severely injured and battling for her life. Her possible savior arrives in the form of Zachariah, a male who has removed himself from Estilorian society for more than fifty years. Fighting an unexpected connection to Tate, he must decide whether saving her life is worth destroying his. As Tate struggles to find a way home, she ends up drawn into a dark Mercesti plot involving multiple murders and a powerful ancient artifact. With the unpredictable Zachariah as her only source for aid, she’ll soon find out if her abilities are strong enough to help her defy her Fate. I've become more fascinated by other writing processes as I've come to realise than my writing process (which is to say, no particular process at all) doesn't fit with my linear personality. Your process sounds fairly similar to other 'creative' types, if only I could get something so relaxed to work for me! Great advice regarding self publishing, Raine. I rely heavily on indie publishers to help with the details but there are a couple of books I am working up the nerve to self pub. Good choice, Alan, to feature one of my favorite writer friends and her awesome latest in a series! Great interview, Defy looks amazing. Thank you, Toby. Great, you liked the Interview. I really, really love the trailer. And of course, the interview rocks. Thanks to all of you for stopping by! Ciara, I'm getting started on your book...you have just the right writing process, if you ask me. Good luck on the self-pubbing, D.C. If anyone can do it, you sure can! And much appreciation to you both, Toby and Kelly, for stopping by and showing some support. Great interview, Raine and I too can't wait to read. Terrific book trailer. So many have the words race by and you can't read them! (I sound like an old lady, I know). But really, really well done. Kudos! So happy to see all your hard work paying off. It's always neat to read about how other authors work in their own processes. I feel like I take a little piece of each of these other authors and incorporate it into my own writing routine. Great interview! Raine, I've read interviews of yours before, and you always manage to present something else fresh and awesome. Loved the trailer, too! Thanks so much, Lorca and Amberr, for stopping by and checking out the interview! I recently had the pleasure of meeting you, Raine, through a blog post. Be sure to let us know if you like your eBook you won! I agree with Rachel, the book trailer is very good and easy to read. Your series sound intriguing. I'm adding them to my TBR! Congrats on the new release "Defy". Thank you, Brenda! I appreciate the wonderful comments, and I'm very much looking forward to reading your book. Best of luck on your writing journey, as well! Karen Janowsky has loved superheroes and ancient mythology since the first time she saw the Super Friends on television in 1970’s. Because flying an invisible jet was never a viable career option […] she teaches yoga and writing at the College of Southern Maryland. "When superheroes fall in love, anything can happen." "Love is hard, even for superheroes..."
"When gods and superheroes fall in love, it takes gods and supervillains to keep them apart." "[...] The ending of this book was very good.. I loved how she ended it.. and better still, there will be a book 2 for Georgia and her family. So I thank you Ms Kingslie for an awesome book." "refreshing read, it was gripping and had a plot that I could automatically get on board with. Burnett’s writing style was on point, and he very much painted a full picture of the characters lives to me, ensuring they were engaging and held your attention." "A beautiful but sometimes tragic story of love, loss and new better beginnings. [...]"
"This book. WOW. Seriously it's amazing. I love how you're kept on your toes the whole way through trying to figure out who Anonymous really is." "This was one of the best mystery/suspense thrillers I have read in a long time. Jessica and Owen move to Florida after the death of their son. There are some very strange things happening [...]"
"Jack Allen's intriguing spy thriller gets the pulse throbbing almost from the start, and doesn't let it stop until the final, surprising twist in the end. This plot-spinner-with-heart knows how to keep his readers reeling with action and high drama [...]"
© 2012 - Indie Author News. Powered by Blogger.